Lunchbox Dad: The Strangest Netflix Giveaway Ever! You guys I am so excited for the Stranger Things Season 2 to come out on Netflix! I regularly scour the news for updates, I have my T-shirt, and I have been basically waiting on pins and needles for October 27th, 2017 to arrive. The only thing that's just as fun is that Netflix gave me two three month subscriptions to give away to a few fans in order to celebrate the new release! But more on that below. To prove to you how big of a fan I am, here is a fun little food art project I made after watching season one of Stranger Things. 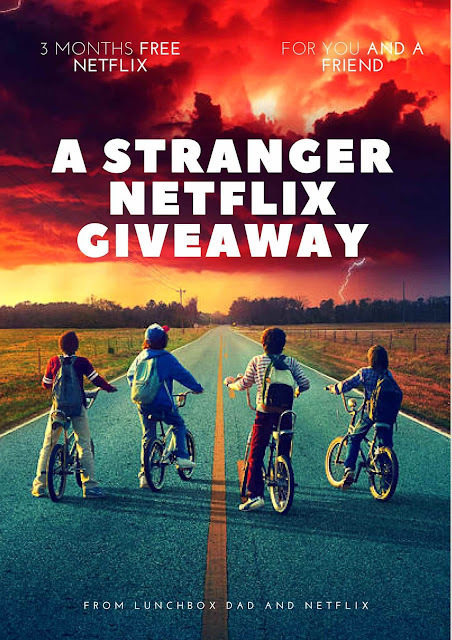 So in order to win this stranger Netflix giveaway, you must go to my Facebook post here. Reply in the comments by briefly telling me why you love Stranger Things and tag one friend of yours who DOESN'T HAVE NETFLIX. I will choose one set of entrants and both of you will win three free months of Netflix to bings on Stranger Things season 1 and 2, or any other Netflix shows your family desires. So head over to my Facebook page right now and enter to win! I am a member of the Netflix Stream Team. Netflix supplied the free subscriptions for my readers but all opinions are my own.